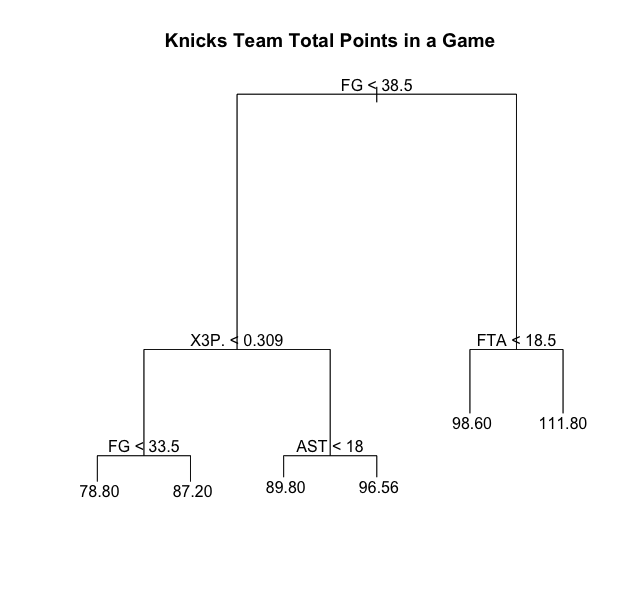 From this regression tree, we see that if the Knicks for example make less than 33.5 FG’s in a game, and have a 3-Point shooting percentage of less than 0.309, they will be expected to score no more than 79 points in a game. On the other hand, if they make more than 38.5 FG’s in a game, and also attempt more than 19 free throws in a game, they can be expected to score more than 111 points in a game. 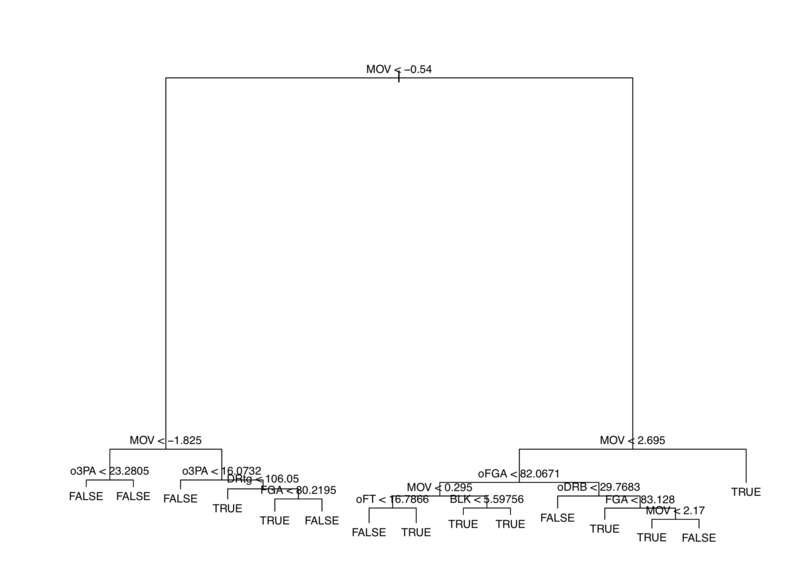 From this regression tree, note that first “Tm” denotes how many points the Knicks score in a game. We see that for example, if the Knicks have less than 28 defensive rebounds in a game, also score less than 98 points in a game, and have fewer than 4-5 blocks in a game, their opponents will slightly outscore them, and win the game. In fact, if the Knicks manage to get less than 28-29 defensive rebounds per game, and score less than 98 points in a game, they will be expected to lose every game they play! Now, let’s say, the Knicks do manage to get more than 28 defensive rebounds in a game, if they still only manage to score less than 89 points in a game, they are still almost guaranteed to lose as well. 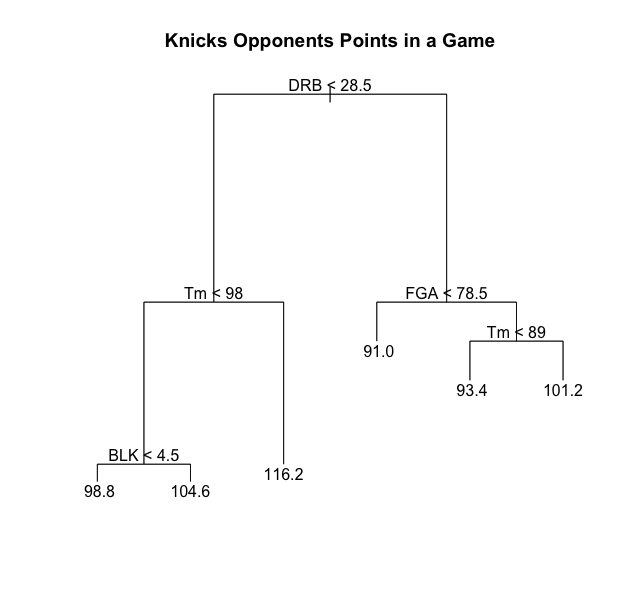 Although, many analysts have probably pointed these things out, the conclusion one draws from these regression tree analyses, is that the Knicks have a significant problem with defensive rebounding, as that seems to be the number one factor in them not winning games. Further, they also have a significant problem with how many points they score per game, which is a direct result of this Knicks team still not running their offense correctly. Would Tyson Chandler have made a difference? As the above analyses show, no single factor determines whether the Knicks win games or not. It is reasonable to assume that if Tyson Chandler was on the team, then, the Knicks would get more than 28-29 defensive rebounds in a game. But, according to the above analyses, and the right of the previous regression team, if they still as a team would attempt more than 78-79 field goals, they would still be expected to lose every game. The question then remains would Tyson Chandler’s presence increase the Knicks’ offensive efficiency? In principle, according to his career FG% stats, I would say yes. According to Basketball-Reference.com, Tyson Chandler had a FG% of 0.638 while in New York, and for his career has a FG% of 0.588, which is quite high for NBA standards. It is quite reasonable to assume therefore, that the Knicks would have considerably less FGA’s (certainly less than 78-79) in a game, and their opponents would be held to around 91.0 points per game. One would conclude that from a statistical perspective, trading away Tyson Chandler was perhaps a mistake and had an overall negative impact on the team’s performance both defensively and offensively.